"Are you what we were, before we learned to talk and made a mess of everything.? Did any good come from all that talk around all those tables?" Continuing, literally, right where the first film left off (well, a piecemeal version of the final sequences of the first film are included, skipping much of the dialogue and the entire cave scene, cutting to Taylor's realization in shadow on the beach), Beneath the Planet of the Apes at first feels like a reenactment of its predecessor. It is not. In September of 1971, after the disappearance of Taylor's ship, a rescue party following Taylor's exact course crash lands in almost identical fashion (but on dry land). The crash is survived only by astronaut Brent (James Franciscus), who happens upon Nova (Linda Harrison), alone after Taylor's mysterious disappearance. Because Charlton Heston refused to do the second film without his particular desired outcome, we have been given this search-and-rescue plot, and I feel we are the better for it. Brent runs the usual emotional gamut of shock and dismay at the goingson of the planet, and is particularly appalled by Ursus' speech, psyching his men up with religious fervor, rallying them to a new Crusade after 11 ape scouts vanish in the Forbidden Zone. " It's a bloody nightmare," exclaims Brent. 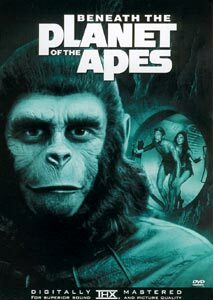 When Nova brings Brent to Zira and Cornelius, his fears are only mildly tempered, and the two humans set off from Ape City to find Taylor in the Forbidden Zone. What Brent discovers in the cave beneath the planet (thus the name) is an advanced, omniscient race of human-like creatures with extraordinary telepathic powers able to produce mirages, alter space and cause men to disappear into thin air. They also attempt on several occasions to force Brent to kill Nova, mostly by strangling. "We are not a violent race, we make our enemies kill each other,"says the leader. Ironically, with all of these god-like powers they are unable to stop the apes from killing them with simple guns. Talk about your bad evolution! This film takes an odd turn with these underground people, with their fanatical devotion to a leftover golden nuclear missile, their god, the Holy Bomb. "Give praise to the Almighty Bomb and the Holy Fallout," goes one of their prayers. When the apes arrive in the Forbidden Zone they are treated to a barrage of mirages, including that of a blood dripping icon of their god, the Lawgiver, and a holy war ensues. While upon first viewing I wasn't too enthused with this film, I had a change of heart after my second viewing. Part of this attitude change is due to the fact that this installment bears a great resemblance to many classic Tom Baker Dr. Who episodes, with its satire on religious fanaticism and its hokey special effects. What is not hokey are the beautiful and elaborate underground sets, particularly Grand Central Station. Add to it some contemporary aspects, such as the group of chimpanzee protestors urging the apes to make peace not war, Brent's psychedelic responses to the underground people's telepathic suggestions, and their assertions that "the bomb is a holy weapon of peace," you realize that even ape movies had meaning, had psycho-social importance! You just don't get films like this anymore out of Hollywood. I don't think the powers that be have much desire to deliver messages, steering public sentiment through film. Everything now is just bigger, more effects, more expensive, while they focus group the film to death. Cookie-cutter plots and characters aimed to make money at the box office and in the toy, videogame and bookstores have overrun the medium. Cornelius put it best: "The problem with us intellectuals is that we have no power." Image Transfer Review: Like the first and third installments, this disc contains a non-anamorphic that passes muster and then some. The image is clean of abrasions and nearly all scan lines, allowing the remarkable sets of the fallen NYC Radio City musical hall, the NYSE, St. Paul's Cathedral, and the extensive footage of Grand Central Station. If there is edge enhancement going on I didn't notice. Another top notch transfer. Audio Transfer Review: I'm not sure why Fox was unable or did not create a 5.1 mix, but the DS2.0 mix is rather robust for a film this age. Where this mix shines is with the incidental music very successfully underscoring the action on screen. Much of the film otherwise is center channel dialogue heavy, and this is well rendered, clear and precise. The highlight of this somewhat shallow transfer is the humming effect when Brent and Nova enter the underground subway tunnel. Not as nice as disc 1, but not as yeoman as disc 3. Extras Review: As is the trend with audio, each disc gets less and less supplements. The 5 films' trailers are included, subtitles in English and French (below the pciture in the lower black bar), a weblink to Fox's site, and a 7-picture photo gallery are the usual suspects. Disc 6 will be interrogated separately. One of the great things about DVD is its ability to bring the past back with a rush of nostalgia, but at a higher level due to pristine widescreen transfers and better-than-average to awesome audio transfers. The studios and rental outlets LOVE DVD, because it breathes new life into the formers' catalog titles, and rents at a much higher rate than normal catalog VHS for the latter. The entire Apes series is a wonder to behold, and this no-nukes treatise separates itself admirably from the rest of the series, while still carrying the torch of the whole, and classic sci-fi in general. Recommended.